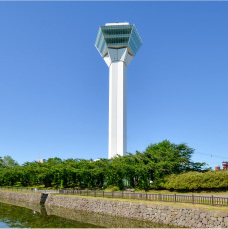 Goryokaku Tower Corporation (hereinafter referred to as “we”) declare that we fully comprehend the importance of personal information protection and our responsibility based on your trust and will handle your personal information strictly and appropriately. In compliance with the Act on the Protection of Personal Information (“Personal Information Protection Act”), other relevant laws and regulations, and the guidelines of competent authorities, we will handle the personal information adequately and take appropriate safety control precautions. For the prevention of leakage, loss, or destruction of personal data in our possession and other safety control of personal data, we will take adequate security precautions, including development of the safety control rules and development of a system to implement such rules, and other appropriate measures to assure the recency and accuracy required to achieve the purposes of use. We will not acquire, use, or offer to a third party any personal information relating to the political opinion, beliefs (i.e. religion, thoughts, and creed), membership in a labor union, race and ethnicity, family origin and legal domicile, or medical and criminal records, as a rule, except if required by laws and regulations. If we intend to acquire, use, or offer to a third party any personal information in order to ensure appropriate business operations, we will obtain consent from the person pertaining to such information and handle the information in strict confidence. We will not disclose nor provide any personal data to any third party except when any of the following conditions applies. You agree to such disclosure or provision. Data is disclosed in a manner that does not identify the individual customer pertaining to such data. We outsource the handling of data to facilitate business operations or for any other reason (in this case, we will appoint an outsourcee with the adequate protection level and will take the appropriate precautions to prevent the leakage and transfer of data). We are required by laws and regulations to disclose the data. We will use the personal information acquired by us to the extent required for the fulfillment of our business. We will use personal information specifically for the purposes stated below and will not use the same for any other purpose. If any of the above purposes of use changes, we will notify you of such change in writing, as a rule, or will publicize the change on our website. We will review and improve the manner of handling personal information and the appropriate safety control precautions as needed. If you have any inquiries about personal data, please contact us by using the contact form.